A little and often … or a panic at the end! This same principle applies to investing – start and keep going on a regular basis, and the “end result” will be far more favourable than a panic approaching in your 50s. Have a look at the graphs below – a 30 year old earning $80,000, has a $5,000 balance and contributes 3% of their income. At age 65, they will have a forecasted balance of $1,000,000 (see graph 1). 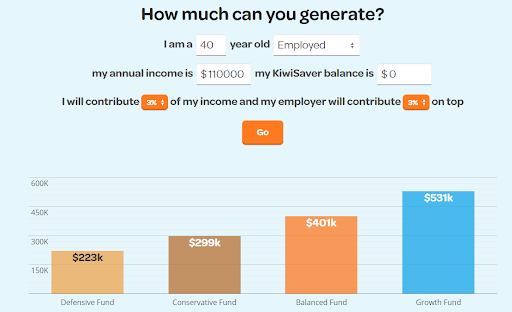 Let’s say that same person starts contributing at age 40 with an income of $110,000 – the balance at age 65 is $530,000 (see graph 2). Have a look at the figures below – a huge difference to your retirement lifestyle! That 10-year difference will have a huge impact on how this client can live in retirement. So keep up the 30-minute exercise regime and start with regular monthly savings and you will greatly increase your chances of a healthy, wealthy retirement!